Apartment Jack is on the first floor without elevator. It has a wonderful view over the lake. 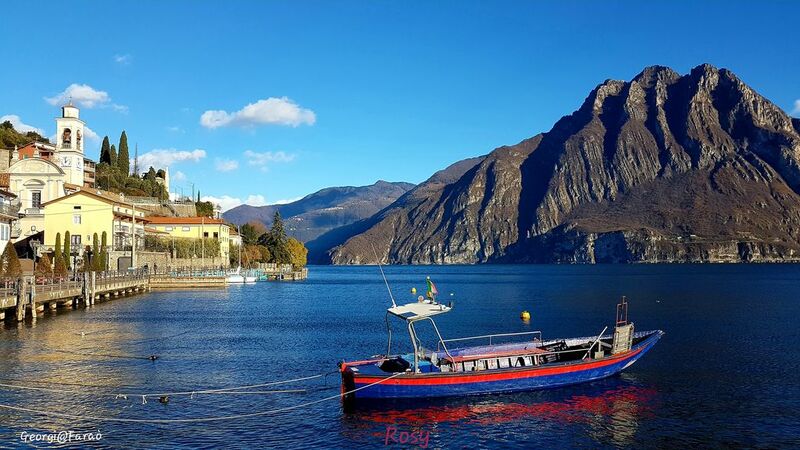 Smallvillage Tourist Accommodation is a place where you can enjoy the peaceful surroundings and beauties of lake Iseo. The selfcatering accommodation is in Riva di Solto, a pleasant holiday resort, much loved by tourists interested in nature, sport, history, calm and good home cooking. It is never too crowded. It's lively on the weekends only. From there you can easily make all types of excursions and trips you like. Smallvillage is situated in the medieval borough of Riva di Solto, only 20 metres from the lake. Recently renovated, it is elegant, comfortable, quiet and good value for money. A free parking area is 100 m away. Nearby, you can find a coffee bar, a pub, a restaurant, a pizzeria, a pharmacy, a tobacconist, a newsagent, a bakery, a butchery, a grocery, a supermarket, an icecream shop and a farmhouse. It is the best place to go on holiday or only relax for a few days. Free WiFi. Car is necessary. The apartment Jack is on the first floor without elevator, it has a romantic view over the lake. The apartment Rosy is a big open space on the ground floor. Private entrance, no lake view. We are Andrea & Georgia, your hosts!!!! Because we love Riva di Solto, it's a wonderful place!!! The apartment was just as advertised. Nice and compact, but absolutely perfect for us. Communication was great, despite a mix up with phone numbers. We were met on arrival and shown around. The apartment is right by the lake, and a very short walk from the ferry to get around the lake and over to the island. The weather wasn’t the best when we were there but it did not detract from the stay at all. Definitely recommend, great value for money. Our holiday to Riva Di Solto was fantastic. The town has charming local shops, restaurants, a gelateria and lovely bar. There is a ferry stop close to the flat so one can explore the whole lake and islands easily. The water front is perfect for walks and running and it never gets too busy. The apartment is clean, tidy and perfect for cooking light lunches and dinners. The living room looks on to a spectacular view of the mountains and lake. My partner and I would love to visit again. "The apartman was very clean and exceptionally well equipped - it was almost as comfortable as staying at home. It is spacious and has ceiling fans in both rooms. Location was also very good, lake is only a few steps away and food can be bought in a little shop nearby. Parking is not a problem as there is a big parking lot about 50 metres from the apartman. The owner is very friendly and flexible." "The apartment was very clean and everything was in good gondition. The location was very wonderful and exotic, lake was very near." Wat een mooie plek zeg! Dorp en appartement waren beide helemaal goed qua locatie, sfeer en uitzicht. Wat een rustige en idyllische plek, met voldoende afwisseling in de omgeving. Ik kom niet zo snel ergens terug, want er is genoeg te zien op deze wereld. Maar wellicht dat ik deze bestemming nog een keer herhaal. Look for low cost flights from UK, The Netherlands, Denmark, Finland, Ireland, Norway, Sweden to Milan-Bergamo Orio al Serio Airport (BGY). Our accommodation is only 40 km away from Milan-Bergamo Orio al Serio Airport (BGY). By Bus - shuttle from the airport to Bergamo railway station; line C from Bergamo bus station (platform 9, 100 m. away from railway station) to Sovere; we can give you a lift from Sovere to Riva di Solto.